The next major step in Hindi’s journey came in 1901, when the Viceroy Lord Curzon recommended that Hindi should be accepted as official language (along with others) in all provinces of India. This was part of his larger scheme to expand the education system in India, which was being bottlenecked by English. By end of the decade, Hindi had become one of the two accepted languages at national level, along with Urdu. With growing Hindu-Muslim divide and Congress’s efforts to keep Muslim League and the idea of partition at bay, leaders like Mahtma Gandhi and Jawaharlal Nehru began supporting the idea of Hindustani as the national language of India. Since Hindi and Urdu were not that different when spoken, they could be easily amalgamated into a hybrid national language: “Hindi + Urdu=Hindustani”. However, the partition essentially made the point moot. With a much smaller Muslim population, Hindi-Urdu was no longer the main conflict. Tensions instead shifted to Hindi vs English and Hindi vs regional languages. The issue was not of minor importance. Right off the gates, in 1946, the debate had begun over which language the Constitution would be written in, and by corollary, which language will be the India’s national language. In one of the first Constituent Assembly debates, a representative from UP, RV Dhulekar began to speak in Hindi when the Assembly Speaker cut him off and asked him to speak in English for the benefit of non-Hindi speakers. Dhulekar refused and began ranting off in Hindi, creating quite a commotion until Nehru told him to shut up. The fight over language was not just a matter of pride, but of economic consequence. 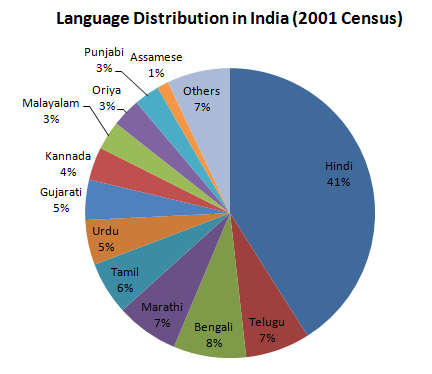 Recognition of Hindi as the official language would have automatically disenfranchised most of non-Hindi speakers from government jobs, higher education and even justice. On the other hand, the right-wingers argued that a national language was critical for unity. Even the moderates agreed that there was need for at least some “link language” to allow the government to function. Nehru, who himself was far more comfortable with English than Hindi, rallied moderates to create a compromise- Hindi would be the national language but English would remain the official language of the government until 1965 Official Language but English would continued to be used by the government until it is phased out at 1965, at which point the issue will be revisited. (See here for distinction between National and Official Language). Their thinking was that since English has no native constituency in India, but is an artificial import from Britain, it is bound to die out on its own within the next 15 years. Meanwhile, other languages were bursting with agendas of their own, foremost being creation of language-based states. Nehru, who had just overseen partition of the country on religion, was reluctant to divide the nation further over language. But the people of these states were adamant, ready to kill and die over the state issue. The first to blow up was Punjab, where Singh Sabhas and Arya Samaj were fighting over the issue of Hindi vs Punjabi. There was considerable overlap, with many Hindus speaking Punjabi. But the whole conflict took on a religious colour. Nehru refused to divide the state over language. In fact, the province was not divided into Punjab, Haryana and Himachal Pradesh until 1966 by Indira Gandhi. But Nehru was not so steadfast in other cases. Most vigorous of these was Telugu movement. The demand for Andhra Pradesh started building up in 1951 and went on until 1952. All through the year Nehru ignored it, until a Telugu leader, Potti Sriramulu died after 58 days of hunger strike. Suddenly all hell broke loose. Riots raged on across Andhra, eventually forcing the Central Government to give way to creation of Andhra Pradesh. 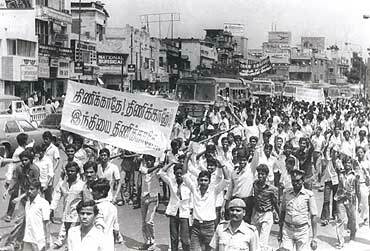 Once the government gave way, every other region in the country began their agitation as well. Eventually in 1956, Indian states were reorganized, creating Tamil Nadu, Karnataka, Maharashtra, Kerala and Gujarat. Creation of the new states ended up inadvertently changing the face of Central Government and Congress. For the first time, backed by consolidated support of one language group, non-Hindi-speaking politicians became a major force in Congress politics. While Hindi heartland of UP and Bihar remained stuck in factional politics within the party, leaders of non-Hindi states could command undivided support of their states. Indeed within ten years of state reorganization, the non-Hindi politicians Kamraj (Tamil Nadu), Ghosh (Bengal), Naliganjappa (Mysore), Sanjiva Reddy (Andhra Pradesh) formed a formidable political group within the Congress Party called the Syndicate (read more about them here). The Syndicate was well-placed by the time the deadline of 1965 for the government to switch to Hindi came around. In the anticipation of the deadlines, the debates had begun in the parliament in 1963, which were only quieted after Nehru gave his personal reassurance that there will be no effort to impose Hindi on non-Hindi states. As soon as he died in 1964, the debate flared up again. At the death of Nehru, GL Nanda was sworn in as Transition Prime Minister for less than three weeks, while Congress found a replacement Prime Minister. During this time Nanda, a vehement Hindi supporter, got the ball rolling by issuing a review of Hindi-fication of the government. As soon as the news reached Tamil Nadu, the state blew up in agitation. Rioting, demonstrations and arsons spread across the state and continued for many months. Tamil students began to commit suicide. Faced with this outcry, the now Prime Minister Lal Bahadur Shastri found himself in a dilemma. On one hand, leaders like Morarji Desai forced him to go through on the language issue, on the other the Syndicate forced him to back down. Finally, Shastri agreed to a compromise which promised non-Hindi states that Hindi will never be forced on them. The compromise was formally accepted through an Act in 1967, with the backing of Tamil Nadu regional party DMK, which was now an ally of Indira Gandhi. The matter was finally put to rest forever. It seems like not having Hindi as the official language was simply accidental. Had the Syndicate not been as powerful as they were, or Shastri as weak as he was, there was a possibility that Hindi might have been ended up being imposed on the rest of the country. In retrospect, that could have been disastrous for the national unity. In South Asia, there are two examples – of West Pakistan imposing Urdu on East Pakistan and Sri Lankan Government imposing Sinhalese on the Tamils – where language conflict led to civil wars. A compromise, then, kept with the general character of the nation as a tolerant country. Meanwhile, in the hands of Hindi fanatics, the language was systematically destroyed. In an effort to make Hindi as “pure” and Sanskrit-based as possible, all words borrowed from other languages were expunged, making the language a ridiculous caricature of itself. All through twentieth century, new innovations and ideas entered into Hindi, not as borrowed words, but as absurd Sanskritic imaginings. Today 422 million people in India speak Hindi, making it one of the most spoken languages in the world. Yet, its literature has decayed to nothing and social acceptance of the language continues to decline. Sources: Brass, Paul R. The politics of India since independence. Cambridge University Press, 1994; Brass, Paul R. Language, religion and politics in North India. iUniverse, 2005; Frankel, Francine R. India’s Political Economy: The Gradual Revolution (1947-2004). OUP (2006); Keay, John. India Discovered. Windward, 1981; Gopal, Sarvepalli, Imperialists, Nationalists, Democrats: The Collected Essays. Permanent Black, 2013; Gopal, Sarvepalli. British policy in India, 1858-1905. Cambridge University Press, 1965; Guha, Ramachandra. India after Gandhi. Pan, 2007. This entry was posted in 1815-1885, British Administration, Congress Split, Hindu-Muslim Antagonism, Hindu-Muslim Antagonism, Jawaharlal Nehru, Nehru, Regional Politics and tagged anti-hindi agitation, constituent assembly, partition, regional language, state politcs. Bookmark the permalink. Personally my understanding is that every Indian should learn at least three languages. First is the mother tongue which is by default, the other is English and last one can be of his/her choice. This will balance the situation rather than antagonizing it. Doing it we can preserve our local languages. This is very informative article about English, Hindi and Indian politics of language. And I support your understanding that every Indian should learn at least three language. Only motto of three language policy is to make all the Indians learn Hindi, which is obviously Hindi Imposition. But what benefit will it be of ? Two languages are more than suffice. Mother tongue and a Global Language. Hindi for a variety of reasons -some natural and some contrived- is found to be becoming indispensable. In Chennai Central railway station Bengalis tourists talk to Tamil shopkeepers in Hindi and Tamils too reciprocate in the same language. Bihari workers in all the four states try to pick up the local languages,but the locals pick up Hindi much quicker -always propelled by business interests and occasionally by being quick on the uptake. Can anyone at this stage force southerners to forget Hindi or not to speak it ? Now that history cannot be changed and thus Hindi’s ‘numero uno’ position (acquired by default) cannot be altered so easily, we have to explore ways to popularize other languages and force the governments to patronize them.Numbers matter,but not always. Only 8 per cent of Pakistanis speak Urdu and over 60 per cent Punjabi.Yet Urdu is their national language (could be for other reasons). Similarly we can argue that mere numbers need not make Hindi the national language. We can start with small things which repeatedly done would effectively counter Hindi imperialism. For ex., why should the menu cards in Chennai or Hyderabad or Bengaluru print the words ‘papad’, ‘dal’,’jeera’ and ‘aalu’. Why should such common Hindi words be cleverly mainstreamed into English and treated as English words. Why not ‘appadam’ or ‘appalam’ ‘pappu’ and ‘urulaikilanku’ or ‘aalugadda’ or ‘bangaladumpa’. This example may sound juvenile but seriously viewed and implemented it would have deeper implications. Let all the competitive exams for central government jobs be conducted in all the 22 languages. Indian cinema means not only Hindi cinema. Allot time slot for films of all the languages depending on their reach and market on national and international forums. Well written! For a while now, I’ve been irritated at what I perceive to be the increasing Hindification of our public discourse. This surprises me because I’m comfortable with the language, love the poetry and the songs, and can recite couplets by the dozen. To clarify my thinking, I spent the day reading up on the politics of language. I found this blog to be particularly good. The last two paras capture what bugs me — the proselytizing fervour of some zealots. Your blog makes history good fun. Mind you, that is something I believed I would never say. Thanks. Every Indian should be able to speak at least three language to communicate with maximum amount of people. Language should not be the barrier between people who are willing to connect. For this three languages are more than enough. First, regional language- to connect with people at the regional level like a marwari speaking with a marwari in an informal communication. Second, English- learning English seems indispensable now to access maximum content on internet, to connect with the world and now-a-days for general speaking also as today pure Hindi is understandable to a handful of people. Now every one is use Hinglish if not English. Third, Hindi- to connect with the people who neither know regional language nor English. And I think it constitutes a wide majority which particularly resides in urban area. Hindi needs to be propagated for the reason too that it comes handy to understand other languages also because it has great affinity with many languages and has many dialects.